Otto Porter Jr. and Markieff Morris hit 3-pointers and Bradley Beal capped a 34-point performance with a three-point play, helping the visiting Washington Wizards run away from the short-handed Boston Celtics in the second overtime Wednesday night before holding on for a 125-124 victory. Jayson Tatum misfired on a potential game-winning 3-point attempt with 3.2 seconds remaining in the second overtime, concluding a valiant effort by a Celtics team missing starters Kyrie Irving (sore left knee), Al Horford (illness) and Jaylen Brown (concussion). Beal had a team-high nine assists for the Wizards, who got an 18-point, 11-rebound double-double from Porter. Washington's Markieff Morris, squaring off with his twin brother Marcus, added 20 points. Marcus Morris poured in a team-high 31 points for the Celtics, who lost for just the third time in their past nine games. 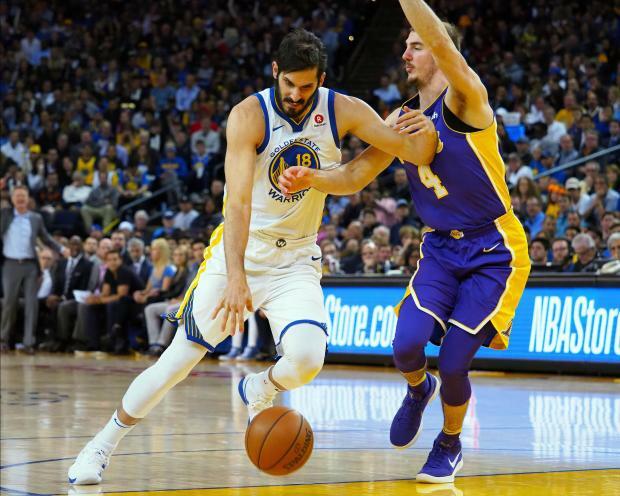 Nick Young, Quinn Cook, Kevon Looney and Zaza Pachulia did all the scoring in an 18-3 run early in the third quarter that propelled short-handed Golden State to a victory over Los Angeles in Oakland, Calif., that completed a season-series sweep. Kevin Durant dropped in a game-high 26 points for the Warriors, who were playing without three All-Stars -- Stephen Curry (sprained right ankle), Klay Thompson (fractured right thumb) and Draymond Green (sore right shoulder). Julius Randle had a team-high 22 points for the Lakers, who were playing the second game of a back-to-back set, having beaten Denver 112-103 in an emotional revenge game Tuesday. Jonathon Simmons established career highs of 35 points and seven 3-pointers to lead Orlando past visiting Milwaukee. D.J. Augustin recorded season bests of 32 points and six 3-pointers as the Magic tied their season high of 18 3-pointers (in 34 attempts) one night after scoring a season-worst 72 points in a loss to the San Antonio Spurs. Nikola Vucevic contributed 22 points, nine rebounds, nine assists and four steals for Orlando. Giannis Antetokounmpo recorded 38 points, 10 rebounds and seven assists for the Bucks, who lost for the seventh time in the past 10 games. Khris Middleton scored 22 points, and Eric Bledsoe added 20. Buddy Hield scored 24 points and Zach Randolph added 22 points and nine rebounds to help host Sacramento record an overtime victory over Miami. Sacramento's De'Aaron Fox contributed 20 points and scored the tying basket that forced overtime. Bogdan Bogdanovic added 14 points, Frank Mason III had 11 points and Willie Cauley-Stein recorded 10 points and nine rebounds. Goran Dragic matched his season high of 33 points for Miami. Wayne Ellington made six 3-pointers while scoring 22 points, and James Johnson added 18 points, 10 rebounds and seven assists.